Director of iConnect, John McEvoy said, “From the outset our ambition was to develop the brand across retail, business and education. The acquisition of Screenway, who have been Apple education solution experts since 2001, completes this three-pronged approach and will see us working closely with schools, teachers and students to ensure the smooth rollout of Apple across the Education system. Our focus in 2015 is the rollout of iPad’s in primary and secondary schools and educating both teachers and students on effective learning through technology. Speaking on the services that they will continue to provide through iConnect, Maureen Casey said, “We work with schools on defining a strategy and then project manage the whole implementation. We’re not in the business of just selling boxes. With an education specialist in each outlet, supported by service provider teams, we help schools deploy and maximize their Apple investments”. 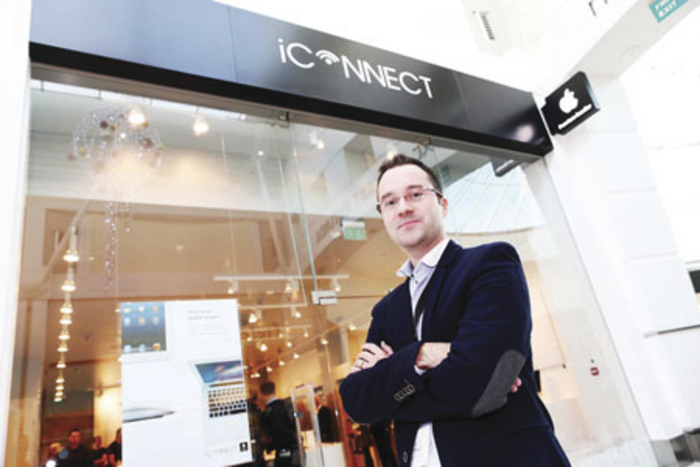 iConnect launched their European delivery in December 2013 when it opened its first stores in Liffey Valley Dublin and Whitewater Shopping Centre in Kildare. Two further stores were opened in 2014 in Foyleside Shopping Centre, Derry and Henry Street, Dublin. iConnect currently employs 60 people and will now see its employment base grow to 80 this month. iConnect is owned by the Al Mana Group. Since being established as a trading house over 60 years ago by the late Saleh Al Hamad Al Mana, Al Mana Group has gone on to become one of the largest companies in Qatar. Employing over 3,000 people worldwide, and with total assets of $1.2 billion, the Group achieved turnover in 2011 of $1.4 billion. Screenway, based in the West of Ireland was formed in 2001. Screenway is an Authorised Apple Reseller who were been hand-picked by Apple for their proven expertise in installing and supporting IT solutions for Education Institutions. This represents a huge endorsement by Apple of Screenway’s long and dedicated commitment to this market. With a deep understanding of Apple products and a broad knowledge of the issues facing educators, Screenway work with Educational Leaders to transform teaching and learning. They help create and maintain state-of-the-art education solutions that will engage students, enhance their performance, and work within the existing infrastructure.